Nolan's Carpets and Flooring stock an extensive carpet range from all major carpet manufacturers. Carpets in Ireland today are still one of the most popular flooring solutions. The advantages of fitting a quality carpet is a carpet adds comfort and luxury you will enjoy for years into the future. There is nothing nicer than the feel of a quality carpet underfoot. 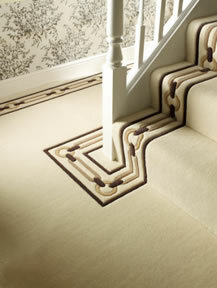 Our carpet ranges include stair carpets, stair runners, bedroom carpets and living room carpets etc. At Nolan's Carpets and Flooring our experienced staff will sit down with you and discuss your carpet needs as you'll need a different type of carpet for different rooms. Nolan's Carpets and Flooring provide a free carpet measuring service, and all prices include free carpet delivery and free carpet fitting. As a privately-owned company with more than 70 years experience in the design and weaving of the world's finest carpets, our products are renowned for their quality and timeless appeal. Navan Carpets are world renowned for providing the residential and hospitality sector with a standard in carpets to be aspired to. Navan Carpets have become synonymous for excellence in carpets. A comprehensive range of plain and heather wool twist piles, textured loop piles and easy clean polypropylene carpets. Most ranges are available in both four and five metre widths. Ryalux carpets have enjoyed a reputation for excellence for decades, as well as our carpets’ superb quality, many collections are available up to 7m wide. Abingdon Flooring is the UK’s largest privately owned manufacturer of quality carpets, currently producing in excess of nine million square metres of carpet per annum. Signature Carpets is the UK’s premier designer and manufacturer of luxury hand made carpets and rugs. Our work is highly respected among interior design professionals.